Welcome to the Camp DuNord & Camp Widji Garage Sale Web Page! Here you'll find a lot of good information on the sale, its dates, volunteer opportunities and lots more! THE 2019 SPRING SALE IS NOW SET FOR MAY! As usual, it'll run three days- Thursday the 9th through Saturday May 11th. Starting May 4th at 12:00pm, you can drop off items off directly at the MerchandiseMart Building, located right inside the Snelling Ave. gate (to the left of O'Gara's, next to the small Police Station). 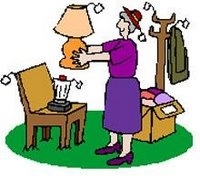 *If you desperately need stuff gone before then, please call 651-442-7226. 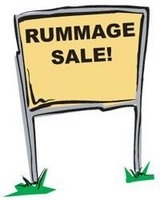 PLEASE NOTE- DUE TO THE RATHER LARGE -YET GENEROUS- DONATIONS OF FURNITURE PIECES, WE'VE FOUND THEY OFTEN DO NOT SELL AND WE MUST PAY TO DISPOSE OF THEM. SO EFFECTIVE IMMEDIATELY, WE WILL BE VERY LIMITED IN THE PIECES WE CAN ACCEPT. For larger donations, please calls us- we may be out and about in our truck and can swing by your neighborhood. Please call (612) 685-4562 or (651) 442-7226 for further information. *If the links aren't working, you may have to cut and paste the line into your browser address line. Twice per year we have a sale- usually May and October (same time that property taxes are due!). We collect donations from campers, friends, relatives, neighbors and from just about anybody who wants to donate to a good cause. We start the sale on a Thursday, but we take donations all year long. As you might assume, it takes a while to set up the sale, so we start working at the Fairgrounds on the Saturday before the sale. People can also drop off donations at that location if they like. For larger items or collections of "stuff", we can arrange to have a truck drive to your location. The fall Sale is around the corner, so donate your stuff versus storing it over the winter! The actual sale date starts Thursday, May 9th at 9:00am. If dropping off your donations, we ask that you do so any time from Saturday at noon May 5th through Tuesday the 11th. Please email us to schedule a pick-up for items you're not able to bring to us. No direct affiliation with the YMCA of the Twin Cities.